Green coloured, sweet flavoured, high in fibre, rich in nutrients, cooks faster, helps control body weight, lowers blood pressure and much more. That’s green gram for you. Wash it. Soak it. Sprout it. Cook it. Grind it. Make rasam, curry and have it with hot, steamed rice. Dry roast it. Dry grind it. Use the flour to make tasty rotis or parathas. Wash it. Soak it. Wet grind it. Generate healthy versions of dosas and idlis. In this recipe, green gram has been combined with greens. What’s cooking…? Delicious Red coloured Rasam boiling and a close-to-finish fresh Green coloured Curry tossing! Rasam powder 2 tbsps. approx. Wash greens (dantina soppu) and tomatoes thoroughly in salt water. Drain out the water. Chop greens finely. No need to chop tomatoes. By this time, green gram would have been half cooked. Remove the lid of the pressure cooker. Add these chopped greens and salt and over this, add tomatoes. After 2 whistles, switch off the pressure cooker. Let it cool. While the cooker is cooling….grate raw coconut. You still have time to spare? Use it to read footnotes given at the end of this recipe. By now, pressure in the cooker would have subsided. Transfer the contents on to a colander to drain the water to another vessel. Use this precious water as you proceed making the rasam. Finish grinding using ingredients listed under “For grinding”. Grind it to a fine paste. Add this to the drained water that you stored just now. Add salt. Boil for about 5 min. Add tamarind juice. Let it boil for another 5 min. Switch off the burner. Now is the time for seasoning. Heat a drop of ghee in a small skillet. Do not heat it too much. When it is just hot, put mustard seeds. When they crackle, switch off and immediately put cumin seeds and asafoetida. Pour it on to the boiled rasam. 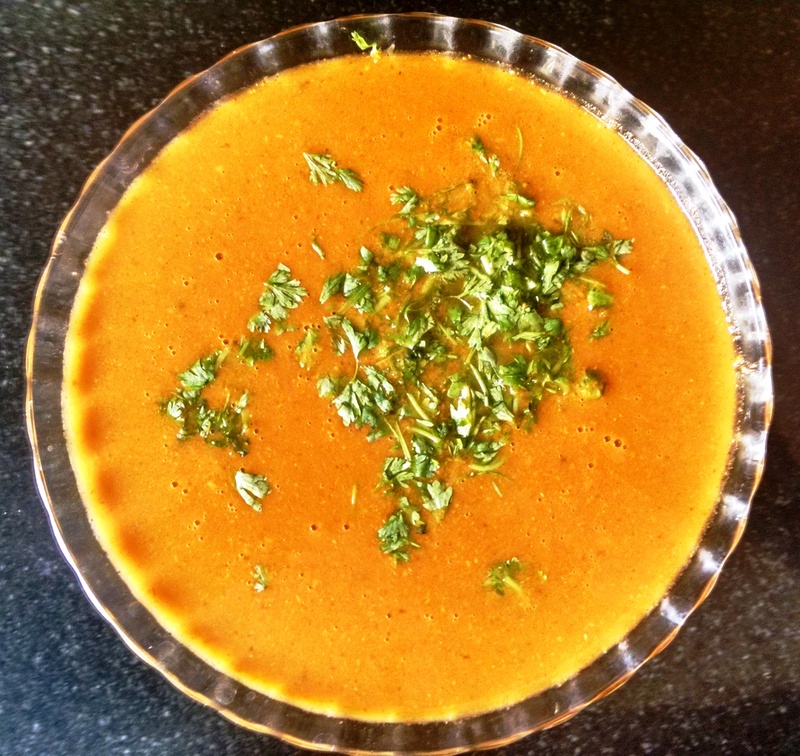 Hmmm….Fresh n fragrant Green Gram Rasam is ready. When using greens, there is no need to add coriander leaves or curry leaves. Quantity of water can be adjusted to suit taste and consistency. Consistency can be as thin as soup or as thick as porridge depending on the amount of water used. Similarly taste can vary from hot and spicy to mildly spicy or made bland. Same recipe can be followed to prepare rasam using Kadale Kaalu (Chick peas), Hurali (Horse gram), Alasandi kaalu (Cow peas). Lentils and pulses should be cooked slowly in low flame for a long time to achieve a comfortably creamy texture. While cooking them, it is better to add a pinch of turmeric powder and a tsp of cow ghee. Turmeric has antiseptic properties. Cow ghee gives a rich and pleasing flavour. A tsp of ghee consumed everyday improves blood circulation, lubricates the bone joints and cleanses the liver.